The world of reptiles may well include creatures that are more spectacular than the Gehyra variegata, but nevertheless, this small nocturnal gecko has managed to make a couple of fascinating new contributions to the discussion about the ecological consequences of climate change. These geckos are small grey- or brown-skinned lizards that grow to around five centimetres and spend their lives in the deserts of Australia. The hollowed-out trunks of eucalyptus trees are their preferred hiding places. After spending the night hunting insects, this is where they seek refuge from the heat in a climate where temperatures can often climb to more than 40 degrees Celsius. And it is in exactly these deserts where climate scientists expect to see even more extreme conditions in the future. They are forecasted to become even hotter and drier worldwide. So how will the unique animals and plants that live in these ecosystems cope with these new challenges? This was the question the researchers set out to investigate, using this little gecko as a representative of other nocturnal desert inhabitants. Prof. Klaus Henle, head of the Department of Conservation Biology at the Helmholtz Centre for Environmental Research, began collecting data about Gehyra variegata as far back as the 1980s. Working in the Kinchega National Park in Eastern Australia, he and his colleagues have been catching, measuring, photographing, tagging and then releasing reptiles for more than 30 years. The researchers at the Helmholtz Centre for Environmental Research then collated this information with weather conditions in the national park, and also with global climate phenomena. Their findings are surprising, to say the least. 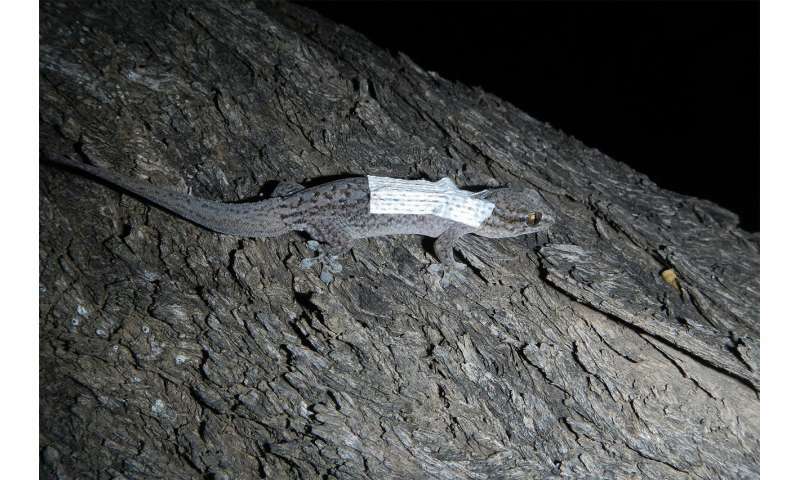 As biologist Annegret Grimm-Seyfarth said, "We expected the higher temperatures and greater dryness to have a negative effect both on the individual geckos and on their populations." After all, even lizards need a certain amount of moisture to ensure that their eggs develop properly, and to enable them to moult when they need to. If they dry out completely, they will die. And the same is also true if excessive temperatures cause them to overheat. "But our investigations revealed that our geckos grow and survive particularly well in the very hottest years. In fact, they are generally in better condition, and their populations grow rather than fall." But what could be the reason? To discover this, Grimm-Seyfarth carefully observed the lizards' behaviour and measured their body temperature. 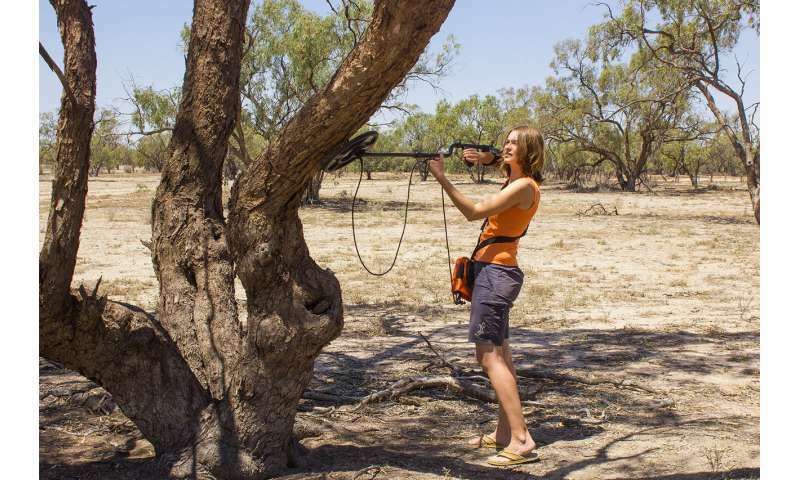 At night, she used an infrared thermometer, which can measure temperature at a distance, to locate the creatures while they were hunting. And then, to find where the geckos were hiding during the day, the scientists used tiny passive transmitters, similar to those used as ID chips for dogs. These chips are usually implanted under the skin. But when the tiny reptile is only five centimetres long, this isn't really feasible. So, the scientists created miniature backpacks for the geckos to wear, which keep the chips close to their skin. The researchers then use a radio antenna to locate the chips. The chips not only reveal where each lizard is, but also transmit its body temperature. Despite the tremendous daytime heat in the desert, the scientists discovered that the geckos don't search out particularly cool places to hide. They prefer their refuges to have a temperature between 30 and 35 degrees Celsius. As Grimm-Seyfarth said, "The creatures need these high temperatures so that they can digest their food properly." Consequently, they also crawl around in branches that are particularly exposed to the sun. To her astonishment, Grimm-Seyfarth also found that, in cooler years, the geckos left the safety of their tree and deliberately sat out in the sun to bask in its heat. But searching for enough warmth also takes energy. And, if the search is unsuccessful, the gecko can't digest its food properly. This might be the reason that cooler years had a negative effect on the geckos. However, even having the perfect temperature range isn't any good if it's also too dry. This doesn't just cause physical problems for these creatures. In particularly dry periods, there are also fewer insects for them to eat. As expected, geckos experience really hard times during periods of drought. But it's not just local precipitation levels that are the decisive factor. Every few years, the La Niña weather phenomenon brings torrential rainfall to the east coast of Australia. Months later, the rivers bring the resulting flood waters to the desert, increasing humidity levels and creating an abundance of insects. As Grimm-Seyfarth said, "These lizards are affected by local conditions and global climate phenomena alike. We need to look beyond the horizon of a particular area if we want to make an accurate prediction about the future of its inhabitants. Until now, all the evidence indicated that the geckos would face problems caused by drought rather than by heat. But now, we have discovered that they can also compensate for this, to a certain extent. The study shows that, although individual creatures become thinner in years of drought, their population levels remain constant. This is because they scale back their growth and reproduction rates in hard times," explained Grimm-Seyfarth. They can then concentrate all their efforts on surviving into the next year. Thanks to their exceptional longevity (up to 28 years in some cases), these creatures can afford to lose a few reproductive cycles without any particular problem. And when conditions improve again, they can make up for lost time. Therefore, even if climate change causes deterioration in living conditions for these geckos, they're hardly likely to die out immediately. And, according these evaluations by the scientists at the Helmholtz Centre for Environmental Research, these findings could also apply to other long-lived desert dwellers. However, this is in no way a simple carte blanche for letting climate change just happen. "If there are several very dry years in succession, the creatures will no longer be able to cope," said Grimm-Seyfarth. At some point, even the hardiest survival specialists will be overwhelmed.